A flashback tale of Captain Britain & Spider-Man. In the midst of spring cleaning, Meggan discovers a scrapbook of Brian's, which includes a picture of Peter Parker, whom Brian says is, in many ways, responsible for the hero he is today. He proceeds to tell her a story from his time as Peter's roommate in college, when he was training with Spider-Man on how to be a better superhero. After arguing with Peter and nearly getting into a fight with a group of foreign exchange students, Brian is in a bad mood the next night when he meets Spider-Man for their training session. This prompts Spider-Man to bow out. 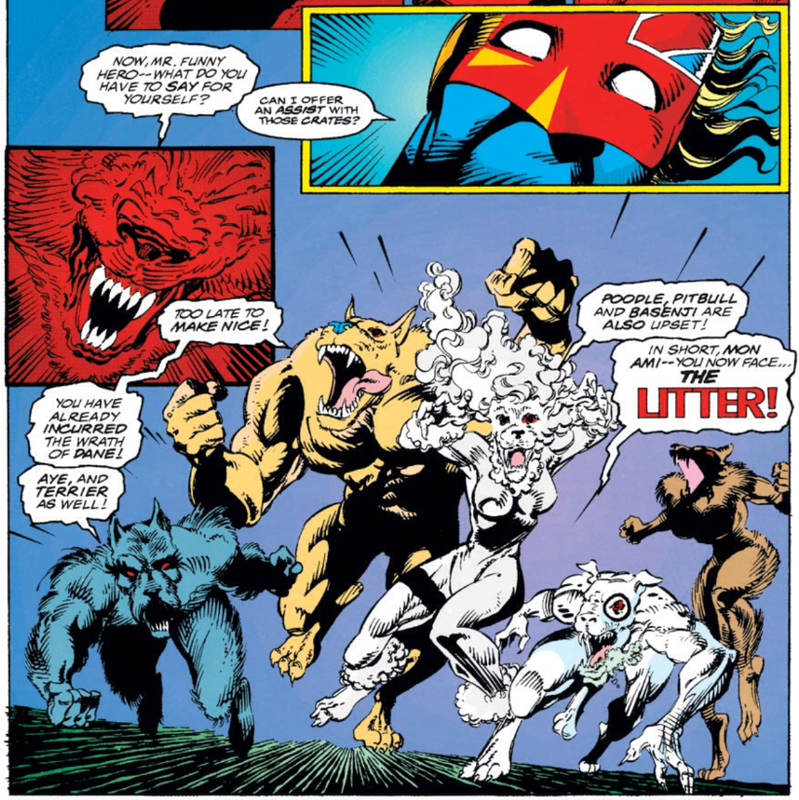 On his own, Captain Britain encounters the Litter, the foreign students he ran into before, who transform into humanoid dogs and attack him. 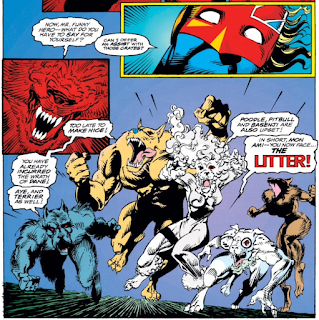 Their fight draws Spider-Man's attention, but Captain Britain goes too far, using lethal force against one of the Litter, nearly killing her. Instead of calling an ambulance, a shocked Brian flies away and wanders the city, realizing he's never been held accountable for his actions. But when he returns home, he finds Peter waiting, and is told he has to leave. In the present, Brian tells Meggan this provided the wake-up call he needed, and he returned home resolved to be a better person and hero. The bulk of this issue is a flashback story set immediately Captain Britain's first American appearance, teaming up with Spider-Man to battle Arcade in Marvel Team-Up #65-66. 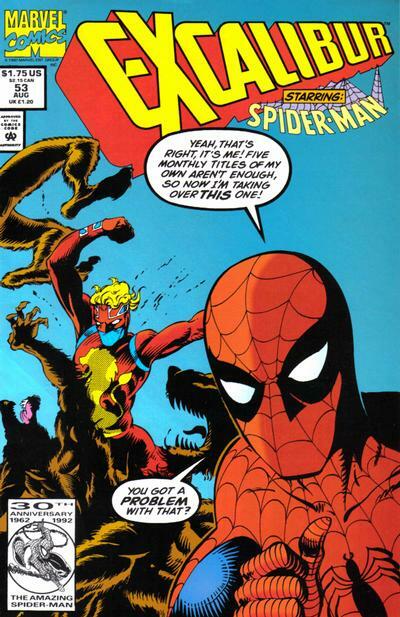 Whereas the previous two issues had fill-in artists but Alan Davis remained as writer, this issue is written by Scott Lobdell, with art by James Fry (who, while no Alan Davis, is not bad). Davis returns next issue. The villains of the flashback story are the Litter, a group of foreign exchange students who can transform into humanoid dogs. The cover pokes fun at the ubiquity of Spider-Man, who in 1992 was carrying five separate titles (including the Marvel Tales reprint book). 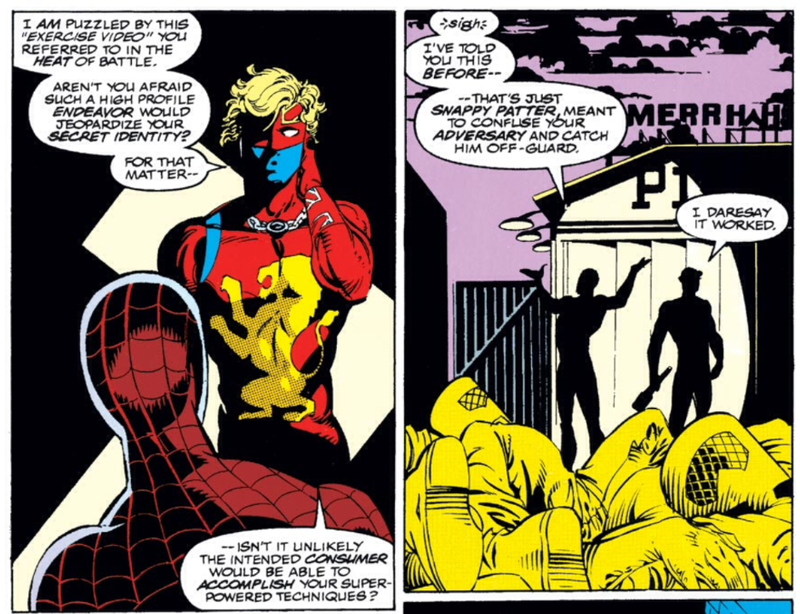 Captain Britain acts at times like he's some kind of alien robot visiting Earth instead of a Brit in America, unfamiliar the concept of "humor" (ie he's confused that Spider-Man would release a secret ID-compromising exercise video, when that's clearly just him bantering). This story also seems to suggest that despite Peter Parker and Brian Braddock living together and working together as Spider-Man and Captain Britain, they don't know each other's secret identities. Which seems odd, but I assume is how their relationship was presented in Marvel Team-Up #65-66. 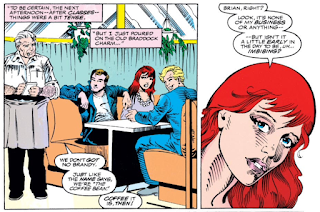 Brian's drinking problem is referenced, as Mary Jane notes it's early to be drinking already after he tries to get a morning brandy from the Coffee Bean. Another fill-in issue, with this one the most fill-in-y of the last three issues, featuring as it does only Captain Britain and Meggan in the present and otherwise telling its story almost entirely in the past. As an inconsequential fill-in, it's fine. The villains are fairly lame, but the flashback story is really more about Captain Britain gaining a sense of heroic morality than it is about fighting villains, and for someone who hasn't read a lot of the pre-Excalibur Captain Britain, it was fun to see a younger, less experienced Captain Britain in his original suit. But this is nonetheless entirely filler and utterly superfluous and skippable, and more annoying, Lobdell struggles with young Captain Britain's voice, making him sound way more foppish and "British" (for lack of a better term) than ever before, and suggesting he's unfamiliar with some pretty basic concepts (though Lobdell's Spider-Man is not bad). Perhaps the idea is that as he's aged and become more heroic, he's lost some of that upper class veneer, but that seems like a stretch. Instead, Captain Britain just doesn't sound much like himself throughout most of this issue. Tomorrow, Wolverine teams up with Terror in Wolverine #58. Next week, Marvel Universe Series III trading cards. I skipped this issue (no Davis, no Pushpaw), but I'm strangely charmed to find out that it was set in the time after MTU #65-66. While that's a fun story, it always bothered me that it set up Brian as Peter's temporary roommate...and naturally it was never referenced again. So if nothing else, at least it filled in a gap! The stated reason why they did away with MTU was that they ran out of ideas how Spider-Man would plausibly meet a new superhero to team up with for every issue, and it's hard to have roommating Captain Britain pop up as your go-to example when hearing that. 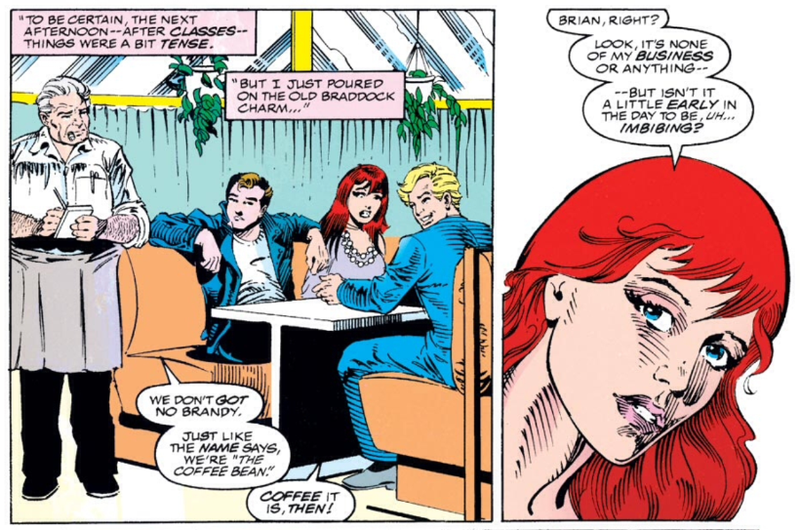 Funny that he has to explain Meggan who Arcade is. I don't know, the premises is difficult. The way the plot starts unwinding, there's absolutely no possibility of depriving the reader the obligatory pun on the auld "with great power" adage, but once you deliver it it turns into obvious one joke issue. That having been said, "Although he (Peter Parker) couldn't know it..." :D I can't believe you omitted the panel. That’s a handsome cover but running a similar gag two covers in a row is questionable. Also the twisting perspective of that logo still bugs the heck out of me. As for Peter and Brian not knowing one another’s secrets, I read it as Peter having figured out Brian’s — which, just circumstantially, seems like the easier realization — but not the other way around. The idea of Spider-Man having a veteran’s wisdom in this scenario, overall, was appreciated. Plus, while aspects of the script are clearly not top-shelf material, Peter as Peter and not Spider-Man being the one to whom Brian ascribes the life lesson makes for a nice touch. There was the old AMAZING issue where Peter went after Gwen Stacy to London after her father died, but ended up doing some public Spider-Manning and then didn't meet Gwen because it would have been too easy deduction for her. "Peter, this is Brian Braddock, from Britain". "I'm Captain Britain." Yup. Peter didn't fool Daredevil, though. And obviously not Wolverine. Nor Captain Stacy. Catching up on old posts this evening. Peter does deduce Brian's dual identity in those MARVEL TEAM-UP issues, pretty much exactly as Teemu suggests. Brian, on the other hand, fails to figure out Peter's secret despite walking into Peter's bedroom and spotting Spider-Man swinging away. He assumes Spidey has kidnapped Peter! I like that two-parter, though I agree it's pretty dumb to set up Brian as Peter's roommate (even if it is "temporary") and then never reference it again. Brian claims that he paid for the woman's medical bills as soon as he got to England but the problem is that Brian returned to England amnesiac as a result of being magically attacked by a villain on the plane. Here in Brazil, this issue was considered so filler that wasn't even published. I believe Lobdell wrote Spider-Man in a good way, 'cause I liked how he handled the caracter in Uncanny X-Men #346 (the Operation: Zero Tolerance tie-in with Narrow).